There are many different types of word processing platforms available now and most people are getting very used to taking advantage of the many different formatting options available. The result can be documents that really look fantastic. However, sometimes you just need a basic document that doesn’t have any extra formatting in it. 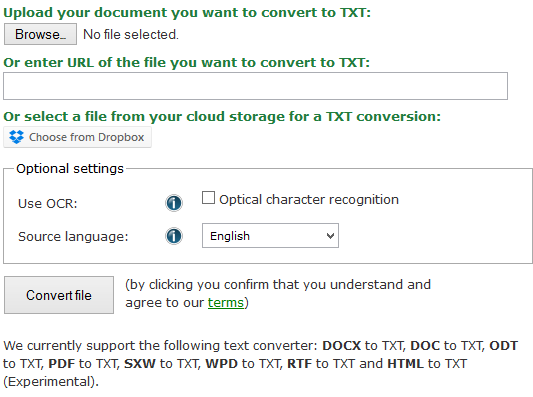 If this is the case, you need to convert your documents, and the best option is to convert from DOC to TXT. The DOC file extension comes specifically from Microsoft Word and that is by far the most popular word processing platform, however the information problems we’re talking about also apply to most of the different word processors. Word and all the other word processing software have all those formatting “bells and whistles” that are available, but they sometimes get in the way. In addition to the different formatting options that you can clearly see in the document, there are usually additional characters added “behind the scenes”. These are characters that you won’t see if you look at the text of what you wrote, but if you copy and paste that text into a different type of platform, there may be extra characters. Unfortunately, you usually won’t see these extra, hidden characters until after your work is submitted. It’s usually much safer to convert your documents from DOC to TXT before you submit them. There are many different areas where these hidden characters become a problem and they usually apply to submitting documents online. If you are working on a website, it is always recommended to convert your documents from DOC to TXT before you add the copy to your website. If you don’t, you won’t know for sure what your post will look like, until it’s actually published and people can see it. The same situation happens when you are submitting documents to other websites. One of the most popular scenarios is if you are job hunting and want to submit your resume to an online job search website, or even to a specific company. If you copy/paste from your Word document, the version your potential employers will see could have many different types of special characters in it. That will make your resume appear unorganized, messy and it will appear as though you didn’t proof read it. That is definitely not the signal you want to send when you are hoping someone will hire you! Take the time to convert your file from DOC to TXT before you submit it and you will dramatically increase your chances of getting a call back. While you’re at it, you should run your documents through an online spellchecker tool to make sure you don’t have any typos. Regardless of the type of document you have, and what you’re going to do with it, it’s a good standard practice to have one version of the finalized document that is fully formatted, and another one that is just a plain TXT file. To do this, you just need to find a good online document converter to make the conversion for you. You could try to just remove all the formatting, but as indicated, this might leave hidden characters in your document that you can’t see. 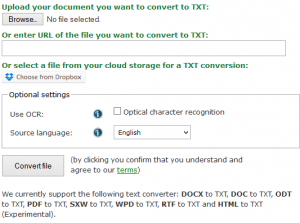 Once you find the right converter, it’s simply a matter of selecting the document you want converted, and following the directions of the converter tool to indicate that you need it to be in a TXT format.